These may be the best cookies I’ve ever made. Actually they might be the best cookies I’ve ever tasted! Seriously, I don’t have a big sweet tooth. I can pretty much eat one cookie and I’m set. These were gone by the end of the next day. In a large bowl, beat butter, sugars, and vanilla until creamy. Stir in 1 1/4 cup flour and baking soda. Add a little more flour if it looks too wet. Stir in chocolate and macadamia nuts. *This is where I would say to cool them on a wire rack, but I don’t have one so I just put them on a plate. Nothing terrible happens, although they sometimes stick together a bit. This entry was posted in Home, Kitchen and tagged chocolate, cookies, macadamia nuts, recipes on November 1, 2011 by Shannon. I’ve been making bread for over two years. 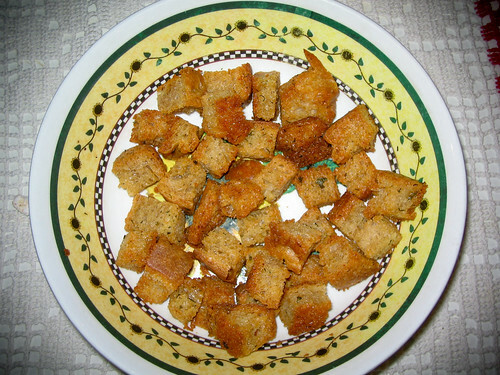 I was making great crusty breads I loved, but I lacked a favorite wheat bread. I wanted something a bit softer, and all the wheat breads I’d tried so far were a bit too dense and just didn’t seem to work with peanut butter in my opinion. My favorite store bought wheat bread is Roman Meal with the round top and I’d been trying to make a bread along those lines. I think this is my winner. Combine warm water, butter, brown sugar, and yeast. Add egg, salt, and honey. Stir in flour with a wooden spoon or stand mixer’s dough hook. 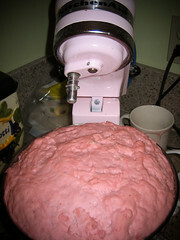 When combined, continue mixing with dough hook for a couple minutes or knead by hand a few minutes. Cover and let rise in bowl for about an hour. 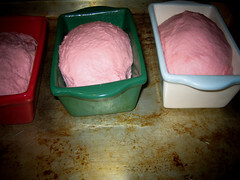 When ready to bake, form into a loaf and place in a greased loaf pan. Slash the top and let rise another 40 minutes or so. Brush top with melted butter if you like and bake at 425 for 25-30 minutes, rotating the pan halfway through. This entry was posted in Home, Kitchen and tagged bread, recipes, wheat on October 26, 2011 by Shannon. Cook macaroni according to directions on package. Drain and leave in colander. In the same pot, add the butter, American cheese, onion powder, sour cream, and milk. Stir constantly over medium heat until cheese is melted and creamy. Add the cheddar cheese and stir until melted. 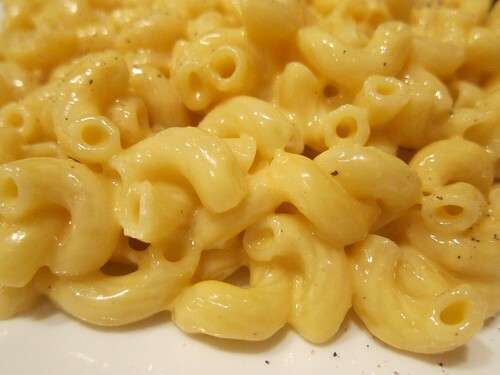 Return macaroni to the pot and mix with cheese sauce. 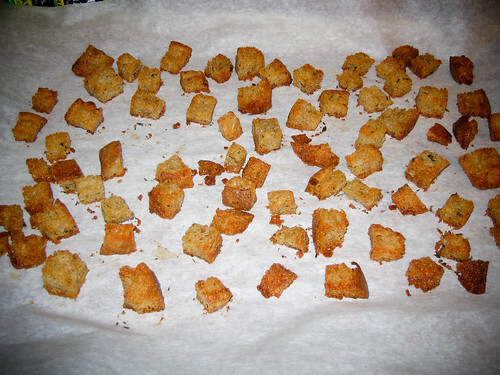 Variation: Add some ranch dressing mix. The first time I made this I used the end of a container of sour cream that had been made into ranch and green onion dip. This gave it an additional ranch flavor. I made it again to measure everything but made it straight. My husband preferred the ranch variation and thought the basic version had a strong sour cream aftertaste. I didn’t notice this, but he doesn’t like sour cream. This entry was posted in Home, Kitchen and tagged macaroni & cheese, recipes on August 25, 2011 by Shannon. 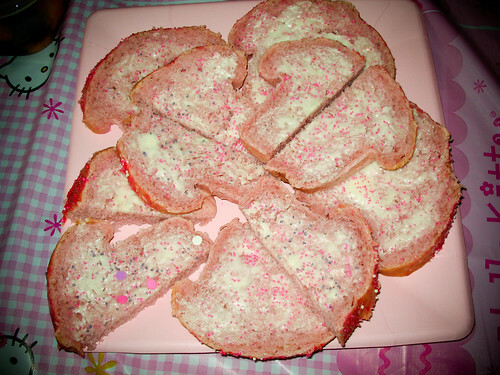 As soon as I found out about fairy bread, I was scheming about how to make it far more complicated more fun. 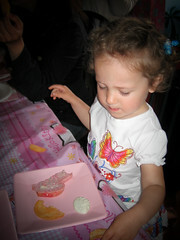 Fortunately for me, my cousin’s second birthday was approaching. 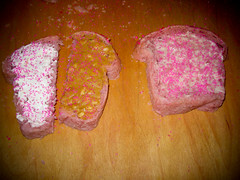 The idea of fairy bread is simple and clever, and of course I would make some with my homemade bread. But why stop there? Why not make a special bread, a whole fairy bread loaf? The idea ruminated in my mind and as I tried to fall asleep the night before I planned to make the dough, the modifications were complete in my mind. So named because it’s not just bread for fairies, it’s not just bread for princesses, it’s bread for a princess of the fairies. 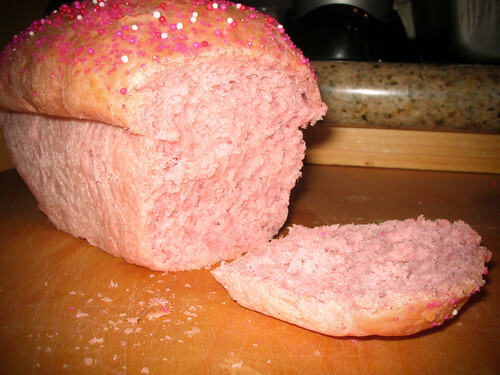 Alternately, it could be the bread that fairies make for princesses. Adapted from Soft American-Style White Bread recipe from Artisan Bread in 5 Minutes a Day. Note: This recipe makes about twice the amount of dough you’ll need for the four mini loaves I show. My extra dough is currently sitting in the fridge(it’ll keep happily there for 7 days), and I plan to divide it in 2-4 pieces and put them in the freezer for future use. You can do the same, make more bread, or halve the recipe. Mix the yeast, salt, sugar, and melted butter in your stand mixer bowl, a 5-quart bowl, or a lidded food container. Add the strawberries, almond extract, and 20 drops neon pink food coloring. Stir so that color is distributed. Mix in the flour without kneading. I stirred a bit with a fork first, scraping the sides and turning the flour over to make sure the liquid was evenly distributing it’s color onto the flour, then used the dough hook on my stand mixer. You can also use a spoon or your hands to mix the dough the rest of the way. Cover loosely and allow to rest about two hours. I use a tea towel or cloth napkin and just put it over my mixing bowl, leaving it right on the stand mixer. If you used a lidded container, set the lid on loosely so it’s not airtight(unless your container has holes because it’s for bread). Seriously, this was my most tall rising bread ever. 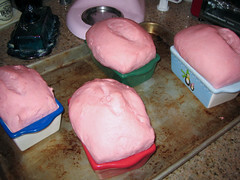 To make mini loaves, grease your loaf pans. Using wet or floured hands(I used wet hands here), take about a handful of dough and shape it into a ball to put in a mini loaf pan. The dough should fill the pan a little more than halfway full. Slash the top of the loaf. Let the dough rest for 40 minutes (1 hour and 40 minutes if the dough was refrigerated). Preheat oven to 350°F. Melt 1TB butter(I microwaved in a coffee cup for 15 seconds) and mix in 1 tsp honey. 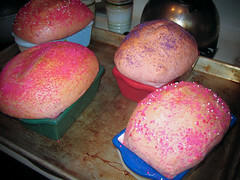 Brush the tops of the loaves with the honey butter and top with sprinkles. Bake for 30 minutes, turning halfway through. I put them on a baking sheet to make it easier. Larger or smaller loaves may need adjustments in cooking time. 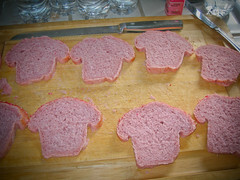 Turn them out of the loaf pans right away and let them cool on a rack or on their sides so the bottom doesn’t get soggy. I tried out a few different things on the bread. Cream cheese, peanut butter, and butter(all with some sprinkles of course). They were all really good. You could also try jam, cream cheese and fruit, or make little sandwiches. 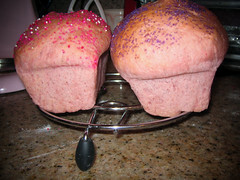 Another variation would be to bake the bread in muffin tins or mini muffin tins to make individual fairy bread loaves. I ended up serving it the traditional fairy bread way; butter and sprinkles. I think Chloe might enjoy the bread more when there’s not a party going on! Extra loaves can be frozen whole and reheated in the oven, or frozen in slices and toasted. 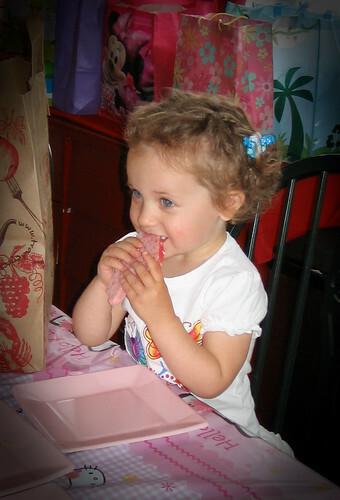 I imagine Chloe has some pink fairy sandwiches in her future! 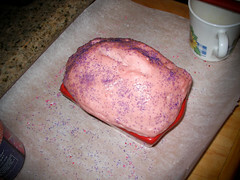 This entry was posted in Home, Kitchen and tagged baking, bread, fairy bread, party, pink, recipes on May 17, 2010 by Shannon. I’ve been browsing lots of recipes and food blogs lately, so it only made sense that I document our meal last night. I have to make dinner anyway, right? A while ago there was a food item on a plate of leftovers from my church MOPS group which I volunteer at that I loved. It was a sort of a hard boiled egg casserole or salad with this cheesy stuff on top and it was just so amazing. I ate it cold, but I couldn’t tell if it was intended to be served hot. Weeks later, there was a day when I couldn’t stop thinking about it and really wanted it for dinner. 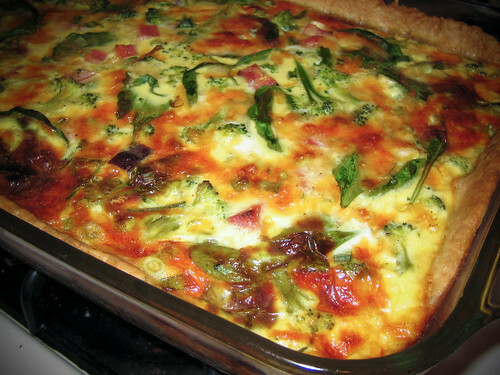 Finally, I googled it and found what looked like my dish, Hard-Boiled Egg Casserole. I had to make it right away. I even went to the store and got Half and Half and Gruyere cheese instead of substituting milk and parmesan or something. It was not only wonderful, but exactly what I’d had! What I found, though, was that I liked the sauce even better on my broccoli than I did on the eggs. So the dinner that I made last night was based on that. I halved the sauce recipe and used that for this dish. Wash your potatoes and poke holes in them with a fork. I put them in my casserole dish and then microwaved them. I used the “baked potato” button, but if you don’t have one, just microwave them for a few minutes. Seriously, it seems like my potatoes are always undercooked if I don’t precook them except in a few situations. When I saw that my grandmother microwaves her potatoes before making scalloped potatoes and ham, doors opened in my mind. I guess you could also boil them first. Meanwhile, start making the sauce. It’s basically a sort of a roux, so if you’ve made macaroni and cheese from scratch you’re ahead. Melt the butter in a saucepan and add in the flour. Cook and stir until it makes a sort of paste. Add a little more flour if you need it. Add the half-and-half gradually as you stir until it starts thickening. Add in salt, pepper, and dill to taste. I didn’t measure these, I probably used 2-3 shakes of sea salt, 4-5 grinds of pepper, 2-3 shakes of dill. If you don’t have/like dill you can safely leave it out or replace it with something you have/like. Parsley, maybe? Add the garlic mustard sauce (or garlic powder and mustard). I didn’t measure this either, I just put in a dab so maybe 1/4-1/2 teaspoon. Add in the gruyere cheese and stir until melty and wonderful. 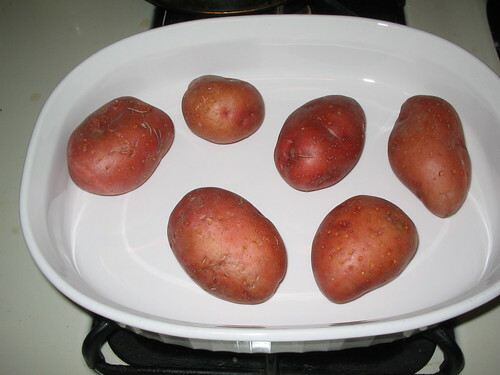 Take your potatoes out of the dish and cut them up to your desired size. Most of mine were sort of rounds, but you could cut them up more and make cubes. Butter your dish and lay about half of the potato pieces out on the dish. Scatter your broccoli amongst the potatoes(I used frozen broccoli and just put it in frozen). If you want ham, cut it up into small pieces and scatter about half on top of the potatoes and broccoli. Pour/spread about half of the sauce on top. 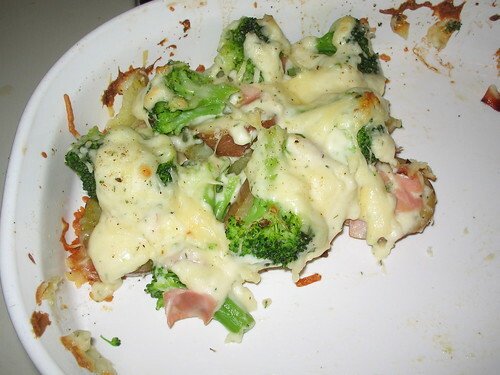 Scatter the rest of your potatoes, broccoli, and ham on top and pour on the rest of the sauce. Top with parmesan cheese and a few more grinds of pepper if you like. Bake at 375°F for about 20 minutes. I neglected to take a picture of it after it came out of the oven before it was attacked, but here’s a portion of it. When I was putting the casserole together I thought it didn’t look like enough sauce but it tasted great and I didn’t feel like it was lacking in sauce. You could double the sauce and coat the potatoes more if you want it really saucy, but I don’t think it needed it. This entry was posted in Home, Kitchen and tagged cooking, Home, recipes on April 16, 2010 by Shannon. 1. Preheat the oven to 375 degrees F (190 degrees C). Grease cookie sheets. 2. In a medium bowl, cream together the shortening and sugar. Add eggs one at a time, mixing after each. 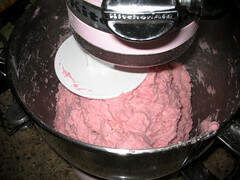 Sift together the flour, baking soda, cream of tartar and salt; stir into the creamed mixture until well blended. 3. In a small shallow bowl, stir together the 2 tablespoons of sugar with the cinnamon. Roll the dough into walnut sized balls and roll the balls in the sugar mixture. Place cookies 2 inches apart on the prepared cookie sheet. Bake for 8 to 10 minutes in the preheated oven. Cookies should be slightly golden at the edges. Remove to cool on wire racks. This entry was posted in Home, Kitchen and tagged baking, cookies, recipes on June 22, 2004 by Shannon.